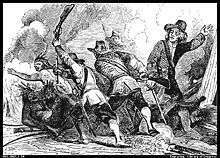 The Pequot War was an armed conflict between the Pequot tribe and an alliance of the English colonists of the Massachusetts Bay, Plymouth, and Saybrook colonies and their Native American allies (the Narragansett and Mohegan tribes) which occurred between 1634 and 1638. The Pequots lost the war. At the end, about seven hundred Pequots had been killed or taken into captivity. Hundreds of prisoners were sold into slavery to the West Indies. Other survivors were dispersed. The result was the elimination of the Pequot as a viable polity in what is present-day Southern New England. The colonial authorities classified the tribe as extinct; however, survivors remained in the area and did regain recognition and land along the present-day Thames and Mystic rivers in southeastern Connecticut. The name Pequot is a Mohegan term, the meaning of which is in dispute among Algonquian-language specialists. Most recent sources claim that "Pequot" comes from Paquatauoq (the destroyers), relying on the theories of early 20th-century authority on Algonquian languages Frank Speck, an anthropologist and specialist of Pequot-Mohegan in the 1920s-1930s. He had doubts about this etymology, believing that another term seemed more plausible, after translation relating to the "shallowness of a body of water". The Pequot and their traditional enemies the Mohegan were a single sociopolitical entity at one time. Anthropologists and historians contend that, sometime before contact with the Puritan English, they split into the two competing groups. The earliest historians of the Pequot War speculated that the Pequot migrated from the upper Hudson River Valley toward central and eastern Connecticut sometime around 1500. These claims are disputed by the evidence of modern archaeology and anthropology finds. In the 1630s, the Connecticut River Valley was in turmoil. The Pequot aggressively worked to extend their area of control, at the expense of the Wampanoags to the north, the Narragansetts to the east, the Connecticut River Valley Algonquians and Mohegans to the west, and the Algonquian people of present-day Long Island to the south. The tribes contended for political dominance and control of the European fur trade. A series of smallpox epidemics over the course of the previous three decades had severely reduced the Native American populations due to their lack of immunity to the disease. As a result, there was a power vacuum in the area. Before the war's inception, efforts to control fur trade access resulted in a series of escalating incidents and attacks that increased tensions on both sides. Political divisions between the Pequots and Mohegans widened as they aligned with different trade sources—the Mohegan with the English, and the Pequot with the Dutch (for a time; the peace did not last between the Dutch and Pequots). The Pequots assaulted a tribe of Indians who had tried to trade in the area of Hartford. Tensions grew as the Massachusetts Bay Colony became a stronghold for wampum, which the Narragansetts and Pequots had controlled up until 1633. John Stone (English rogue, smuggler, and privateer) and about seven of his crew were murdered by the Niantic, Western tributary clients of the Pequot. According to the Pequots' later explanations, they murdered him in reprisal for the Dutch murdering the principal Pequot sachem Tatobem, and they claimed to be unaware that Stone was English and not Dutch. (Contemporaneous accounts claim that the Pequots knew Stone to be English.) In the earlier incident, Tatobem had boarded a Dutch vessel to trade. Instead of conducting trade, the Dutch seized the sachem and appealed for a substantial amount of ransom for his safe return. The Pequot quickly sent bushels of wampum, but received only Tatobem's dead body in return. Stone was from the West Indies and had been banished from Boston for malfeasance, including drunkenness, adultery, and piracy. He was known to have powerful connections in other colonies, as well as in London, and he was expected to use them against the Boston colony. Setting sail from Boston, Stone abducted two Western Niantic men, forcing them to show him the way up the Connecticut River. Soon after, he and his crew were suddenly attacked and killed by a larger group of Western Niantic. The initial reactions in Boston varied from indifference to outright joy at Stone's death, but the colonial officials later decided to protest the killing. They did not accept the Pequots' excuses that they had been unaware of Stone's nationality. Pequot sachem Sassacus sent some wampum to atone for the killing, but refused the colonists' demands that the warriors responsible for Stone's death be turned over to them for trial and punishment. On July 20, 1636, a respected trader named John Oldham was attacked on a trading voyage to Block Island. He and several of his crew were killed and his ship looted by Narragansett-allied Indians who sought to discourage English settlers from trading with their Pequot rivals. In the weeks that followed, colonial officials from Massachusetts Bay, Rhode Island, and Connecticut assumed that the Narragansett were the likely culprits. 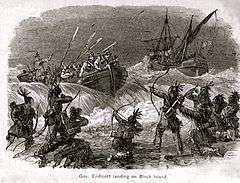 The Puritan officials knew that the Indians of Block Island were allies of the Eastern Niantic, who were allied with the Narragansett, and they became suspicious of the Narragansett. The murderers meanwhile escaped and were given sanctuary with the Pequots. 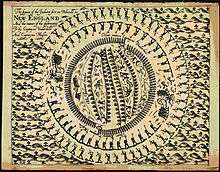 The Mystic Massacre started in the predawn hours of May 26, 1637 when English forces led by Captains John Mason and John Underhill, along with their Indian allies from the Mohegan and Narragansett tribes, surrounded one of two main fortified Pequot villages at Mistick. Only 20 soldiers breached the palisade's gate and were quickly overwhelmed, to the point that they used fire to create chaos and facilitate their escape from within. The ensuing conflagration trapped the majority of the Pequots and caused their death; those who managed to exit were slain by the sword or musket from the others who surrounded the fort. Only a handful of approximately 500 men, women, and children survived what became known as the Battle of Mistick Fort. As the soldiers made the exhausted withdrawal march to their boats, they faced several attacks by frantic warriors from the other village of Weinshauks, but again the Pequots suffered very heavy losses versus relatively few by the Colonists. Mason later declared that the attack against the Pequots was the act of a God who "laughed his Enemies and the Enemies of his People to scorn making [the Pequot fort] as a fiery Oven... Thus did the Lord judge among the Heathen, filling [Mystic] with dead Bodies." Of the estimated 500 Pequots present at Mystic that day, only seven survived to be taken prisoner, while another seven escaped to the woods. The Narragansetts and Mohegans with Mason and Underhill's colonial militia were horrified by the actions and "manner of the Englishmen's fight... because it is too furious, and slays too many men." The Narragansetts attempted to leave and return home but were cut off by the Pequots from the other village of Weinshauks and had to be rescued by Underhill's men—after which they reluctantly rejoined the colonists for protection and were utilized to carry the wounded, thereby freeing up more soldiers to fend off the numerous attacks along the withdrawal route. The earliest accounts of the Pequot War were written by the victors within one year of the war. Later histories, with few exceptions, recounted events from a similar perspective, restating arguments first used by the war's military leaders, such as John Underhill and John Mason, as well as Puritans Increase Mather and his son Cotton Mather. Most modern historians do not debate questions of the outcome of the battle or its chronology, such as Alfred A. Cave, a specialist in the ethnohistory of colonial America. However, Cave contends that Mason and Underhill's eyewitness accounts, as well as the contemporaneous histories of Mather and Hubbard, were more "polemical than substantive." The causes of the outbreak of hostilities, the reasons for the English fear of the Pequots, and the ways in which the English dealt with and wrote about the Pequots have been re-evaluated within a larger context than daily colonial life. Some modern historians have placed the background of the Pequot War within the context of European history (in which religious wars gave rise to increased violence) and Dutch and English colonization in North America, as well as the ambitions and wars of contending Indian tribes during the first half of the 17th century. Such historians have doubts about traditional histories, characterizing them as hegemonic narratives that valorize Puritans at the expense of a "demonized" Indian population. Alden T. Vaughan, a noted historian of colonial America, at first was a critic of the Pequots. Later he wrote that the Pequots were not "solely or even primarily responsible" for the war. He went on, "The Bay colony's gross escalation of violence ... made all-out war unavoidable; until then, negotiation was at least conceivable." ↑ "The History of the Pequot War". pequotwar.org. Retrieved 2015-11-06. ↑ John Underhill, Newes from America; or, A New and Experimentall Discoverie of New England: Containing, a True Relation of their War-like Proceedings these two yeares last past, with a figure of the Indian fort, or Palizado (London: I. D[awson] for Peter Cole, 1638), p. 84. 1 2 3 Mason, John (1736). Paul Royster, ed. "A Brief History of the Pequot War". University of Nebraska-Lincoln. Retrieved 2009-01-01. ↑ William Bradford and other contemporaries indicate that the Pequots who chose to were permitted to join with the Narragansett or Mohegan tribes—in the capacity of freemen, not as slaves. For first-hand accounts, see Lion Gardiner, "Relation of the Pequot Warres" in History of the Pequot War: The Contemporary Accounts of Mason, Underhill, Vincent, and Gardiner (Cleveland, 1897), p. 138, and John Mason's account in the same volume. ↑ For a 19th-century account that reflects Mason, Underhill, and the Mathers, see William Hubbard, The History of the Indian Wars in New England 2 vols. (Boston: Samuel G. Drake, 1845), II:6-7. For narratives from the late 18th century, see Thomas Hutchinson, The History of the Colony and Province of Massachusetts Bay (1793); the magisterial Francis Parkman, France and England in North America, ed. David Levin (New York, NY: Viking Press, 1983): I:1084, in addition to Richard Hildreth, The History of the United States of America 6 vols (New York, 1856), I:237-42 for the 19th century; and Howard Bradstreet, The History of the War with the Pequots Retold (New Haven, CT: Yale University Press, 1933) for the first half of the twentieth century.